Minority students make up a little more than half of the K-12 student population, but less than 20 percent of teachers are people of color. So students of color are rarely taught by people who look like them, and reasons range from poor recruitment and retention strategies to pipelines clogged by discrimination (as my colleague Katrina wrote). Research has demonstrated over and over again that teacher diversity is vital to enhancing school experiences and academic outcomes for students of color, especially in high-need school districts. Increasing teacher diversity has positive effects beyond improving student test scores. For instance, teachers of color are more effective role models for students of color and are less likely to implement exclusionary discipline measures. Teacher preparation programs at institutions of higher education lose potential candidates of color at multiple points. First off, undergraduate students are already less diverse than high school students. Secondly, a significant majority of education majors and teacher candidates enrolled in teacher preparation programs are white. During the 2012-13 school year, 25 percent of teacher candidates in preparation programs housed in institutions of higher education identified as individuals of color. In comparison, individuals of color made up 37 percent of all students in those institutions regardless of major. 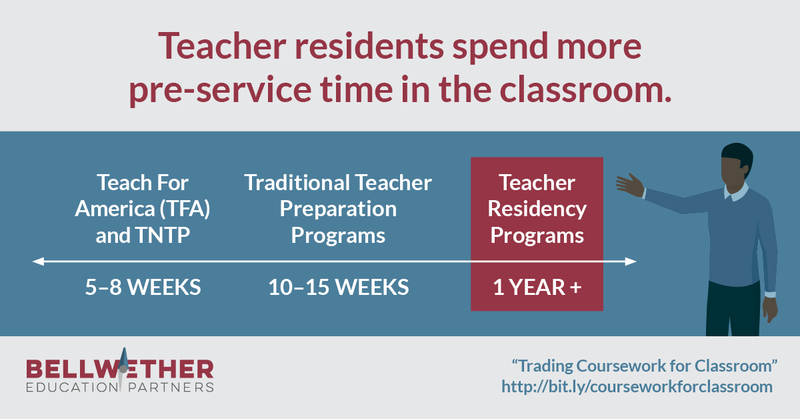 One solution, which my colleague Ashley LiBetti and I discussed in our recent publication, is teacher residency programs. These alternatives to traditional programs have shown to improve teacher diversity. 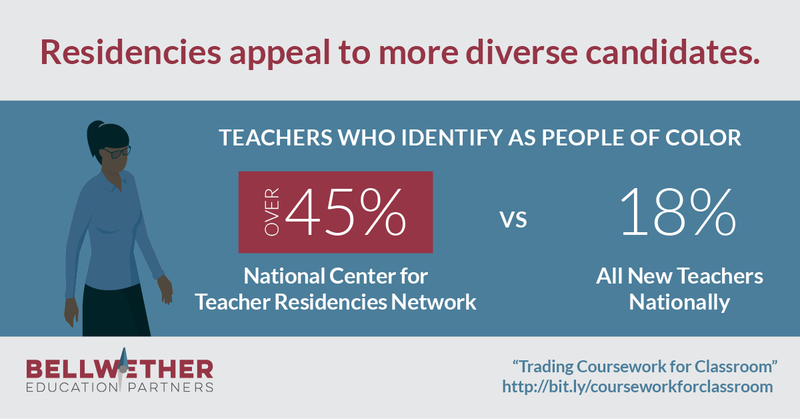 In the National Center for Teacher Residencies network, more than 45 percent of teacher candidates identify as people of color. And nearly 50 percent of Boston Teacher Residency candidates are teachers of color, compared to 38 percent of all teachers in Boston Public Schools. Residencies also target post-secondary graduates of color to ensure that they stay in the profession. Since almost half of students of color are first-generation college students, many do not have the same set of life skills and social capital as their peers who come from middle-to-high income backgrounds. Residency programs provide needed support for these teacher candidates of color as they navigate the teaching profession. For instance, the Southeast Asian Teacher Licensure (SEAT) program in St. Paul, MN primarily recruits immigrant paraprofessionals into their program, many of whom identify as English language learners. SEAT provides academic and personal advising, English language tutoring, technical assistance, and financial support to help teacher residents prepare for teacher licensure exams and successfully complete the program. Residencies also increase diversity by intentionally recruiting teacher candidates of color who come from the local communities. For example, Nashville Teacher Residency works with community-based organizations to diversify its teacher candidate pipeline. These organizations work with specific ethnic groups that make up a significant proportion of the student population. Several programs also recruit individuals of color from high school alumni and paraprofessional networks to build a pipeline of candidates who bring local perspectives. Without targeted and direct intervention, the number of teachers of color will continue to lag. While a large-scale approach is necessary, residency programs show promise in addressing this lack of diversity. This entry was posted in Equity, Talent and tagged #BWTalksTalent, Alternative Preparation, Recruitment, Retention, teacher residencies, Teachers of Color on August 30, 2018 by Justin Trinidad.